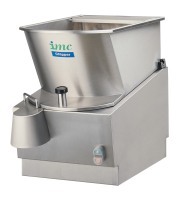 IMC PC2 Potato Chipper The PC2 Chipper has been designed to virtually eliminate waste as well as offering unrivalled reliability and ease of cleaning. The unit is compact, easy to use and can cut up to 25kg of chips a minute - more than enough to satisfy the demands of fish and chip shops, large kitchens and take-aways. A wide range of knife blocks allow operators to cut chips in a variety of sizes and can even cut scallops. Knife blades are manufactured in hardened stainless steel and can be replaced individually to minimise operating costs. The knife block and hopper are interlocked to ensure complete operator safety. The PC2 Chipper can be disassembled quickly and without any tools for easy cleaning. The stylish stainless steel body and hopper simply wipe clean for long lasting good looks.